Kyle MacDonald, BA’03, attended SFU for one year but on the last day of classes in 1998 went to UBC’s Arts County Fair on a whim. When he woke up the next morning, on the floor of some residence off SW Marine Drive, he walked over to the UBC Admissions office and never looked back. Like many of us, Kyle wanted to achieve the dream of home ownership. But there was one glitch – he didn’t have a regular job. What he did have along with his geography degree, however, was an entrepreneurial spirit and a red paperclip. Inspired by the childhood game Bigger and Better, Kyle bartered his way from that single red paperclip to a house in Kipling, Saskatchewan. 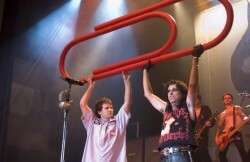 He travelled around North America making each trade in person, initially exchanging his paperclip for a fish-shaped pen and several trades later, swapping one year’s rent in Phoenix, Arizona, for an afternoon with rock legend Alice Cooper. After completing 14 online trades, Kyle became a homeowner. His quest garnered worldwide attention, resulting in hundreds of media appearances and a best-selling book, One Red Paperclip, which has been translated into 15 languages. “It’s the best and only one I’ve written so far,” he says. Don’t look back until you find Kevin Bacon. Never use the Internet or phone. Today, Kyle divides his time between managing his Internet company and speaking at conferences, corporate events, and universities around the world. Despite his fame, Kyle remains grounded. His mom still cuts his hair. I’ve never owned a burgundy Dodge Caravan, but if I did, it’d be that. Otherwise, I can’t say there’s a single thing I own that couldn’t be replaced. I’m much more of a “do” person than a “have” person. Things can be replaced, but our time on earth is finite. My dad, and he still is. He still doesn’t know what he wants to do when he grows up. Neither do I. Anywhere new. I really enjoy the stimulation of new environments. Just being in an unusual place is like creating a painting, every move a new brushstroke. Having breakfast with former UBC President, Martha Piper, and being arrested for a crime I did not commit. The two are unconnected. A book called, The Go Getter. It’s all about separating the passionate from the rule-abiding. If you’re passionate, “no” is never an answer, just an obstacle. I really connected with this book. I speak quite a bit at universities and find people are always hiding behind their education so to speak. “I’m going to use my degree to…” “When I graduate I’ll be able to…” Unless you’re in a specific professional program at school, this is all nonsense. Education is a brilliant thing, but an attitude that you need to achieve a certain subjective level of certification before others will magically open doors is a very tragic one, and opposite to the way the world works. Funny videos of people falling down. Never gets old. If you want to do something, you have to start. It seems inane and obvious, but I can’t stress how important this is to every person with ideas and aspirations. Every long journey starts with a single step. But if you never take that first step you’re going to be sitting there forever. Everyone I’ve ever met would all serendipitously converge on the same breakfast joint. We’d all spontaneously decide to jump in our burgundy Dodge Caravans and head up to Grouse to take advantage of the 48cm of fresh powder and sunshine. Four hours of aggressive alpine skiing later we’d come back into town and play baseball in 34 degree sunny weather and eat a BBQ Indian smorgasbord. Following a little late afternoon waboba-ing, we converge downtown to watch the Canucks take game seven of the Cup in overtime against the Leafs, and we’d throw the largest Decentralized Dance Party the world has ever known. At sunrise it’d be announced that Vancouver was being awarded the summer Olympics and Dr. Alban had just retroactively won the Nobel Peace Prize for his 1992 hit song, “It’s My Life”. Never had one. But here’s a UBC nickname story: When I lived in Totem Park there was this double room for first years that wound up having two guys named Noah in it. I called it The Ark because like Noah’s Ark, there were two of the same creature in there. A Noah’s Ark, if you will. But that never stuck. So we figured the guys would need nicknames for simplicity’s sake. The Noahs were tagged “Brooklyn” and “Hambone” for various reasons. Ninety-seven more wishes. Unlimited wishes would get boring. With only 97 you could waste a few, I mean that’d be fun, but you’d be forced to think of some really good ones. Constraints bring about the most interesting creativity. New laptop. I do public speaking engagements and use a laptop for slides. My former laptop kind of exploded one day. Now I’m a pretty sketchy guy, but exploding laptops in the middle of presentations is where I draw the line. My family/ancestors. Especially the ones I got to meet! I literally wouldn’t be here today without the people who made it happen. Thanks! I was going to write something very deep and inspirational but never got around to it because I was too busy having fun with friends while alive. I highly encourage you to do the same. I did invent something. It’s called Burghinder and is the modern day equivalent of Punch Buggy or Slug Bug, based entirely on burgundy Dodge Caravans. The present. No time like the present. I also recently watched the movie Midnight in Paris, and it renewed my already strong belief that romanticizing about the past or future is a fool’s game, and will only result in being let down. Being unbelievably proficient at music. I’ve learned some instruments over the past but always get bored with practising. I know it defeats the point of music to just – zap! – now you can play unbelievably well! But that’s what I’d like. Take the pill, have the skill. To be able to walk up to any musical instrument and play any song ever made would be amazing. Especially Eurodance classics from the early 90s like Mr. Vain. Instant parties. All the time. “Summer Jam” by The Underdog Project. All three versions including the 2003 German remixes. It’s an inside joke among my friends, but we’ve had a lot of great memories playing this song over the years. Plus, it’s always summer on a deserted island and we’d be getting bronze skin and cinnamon tans, wo oh oh. My dad and I look eerily alike. Arrogant middle-aged men who stand up in the middle of public places, such as airport gates, and talk loudly into their Bluetooth headsets about tedious business details, such as sending faxes. Do you still have the house in Kipling, Saskatchewan? Nope. We lived there for a while and it was amazing. Met some great friends and eventually donated the house to the town where it’s now a tourist attraction and cafe. The one red paperclip thing was never about having the house. It was about the adventure and seeing if it was possible to make it happen. In a way, the challenge was like climbing a mountain. When you climb to the top of Everest, you take a few pictures then come back down and get on with other projects. Everyone who’s still at the top of Everest is dead. I don’t know Kevin Bacon. I don’t know anyone who knows Kevin Bacon. Hey, I’m just here to help!